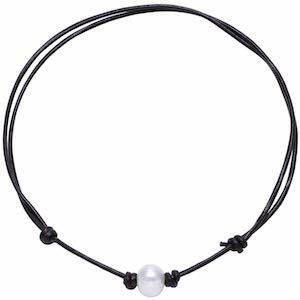 Now there is this great looking Pearl Choker Necklace. The necklace looks really simple and that makes it so special when place around your neck. The necklace is made from leather with a single pearl on the front. We show you the version with an adjustable size for the perfect fit for your neck and perfect as a choker but there are version in different lengths too and you can choose a black or brown cord. I am sure that the single pearl and the dark necklace will look really nice when you wear it around your neck.